The nation’s religious makeup has shifted dramatically in the past 15 years. 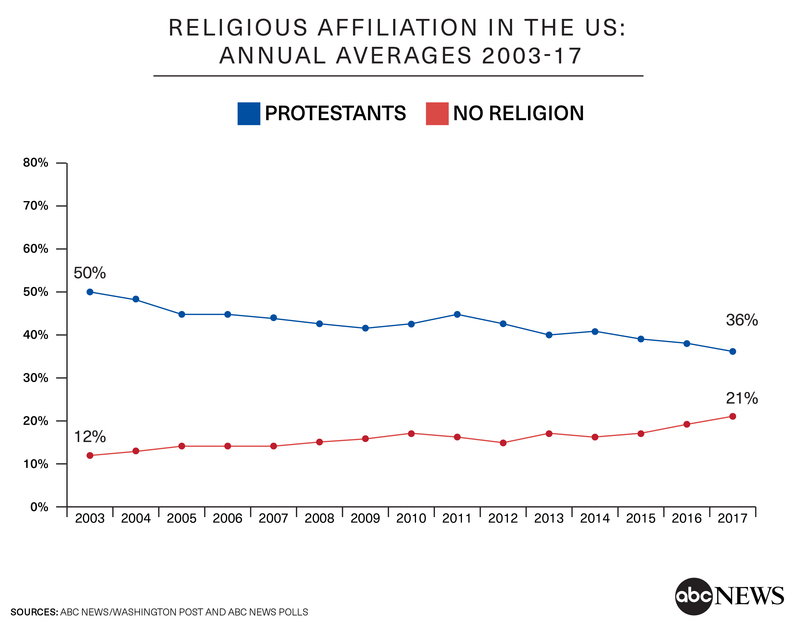 The nation’s religious makeup has shifted dramatically in the past 15 years, with a sharp drop in the number of Americans who say they’re members of a Protestant denomination – still the nation’s most prevalent religious group – and a rise in the number who profess no religion. 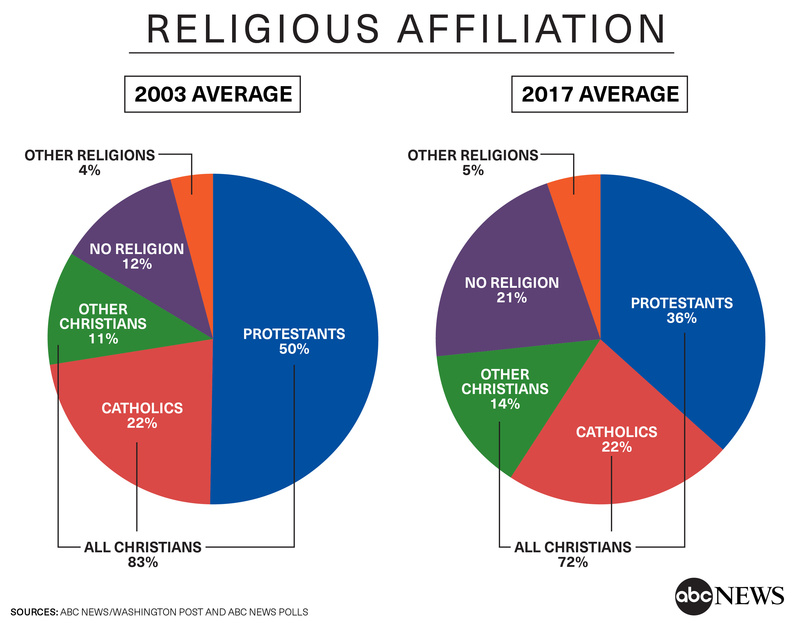 On average last year, 36 percent of Americans in ABC News/Washington Post polls identified themselves as members of a Protestant faith, extending a gradual trend down from 50 percent in 2003. That includes an 8-point drop in the number of evangelical white Protestants, an important political group. Reflecting the change among Protestants, the share of Christians overall has declined from 83 percent of the adult population in 2003 to 72 percent on average last year. In the same time, the number of Americans who say they have no religion has nearly doubled, to 21 percent. Catholic self-identification (22 percent) has held steady during this time. The share of adults who identify with another form of Christianity – including Jehovah Witnesses, Mormons and Greek or Russian Orthodox, for example – has risen modestly, from 11 to 14 percent. This analysis, produced for ABC by Langer Research Associates, is based on a very large dataset – 174,485 random-sample telephone interviews in ABC News and ABC News/Washington Post polls conducted from 2003 to 2017. We focus mainly on 2003 and 2017 data, including 7,185 and 5,017 interviews, respectively. 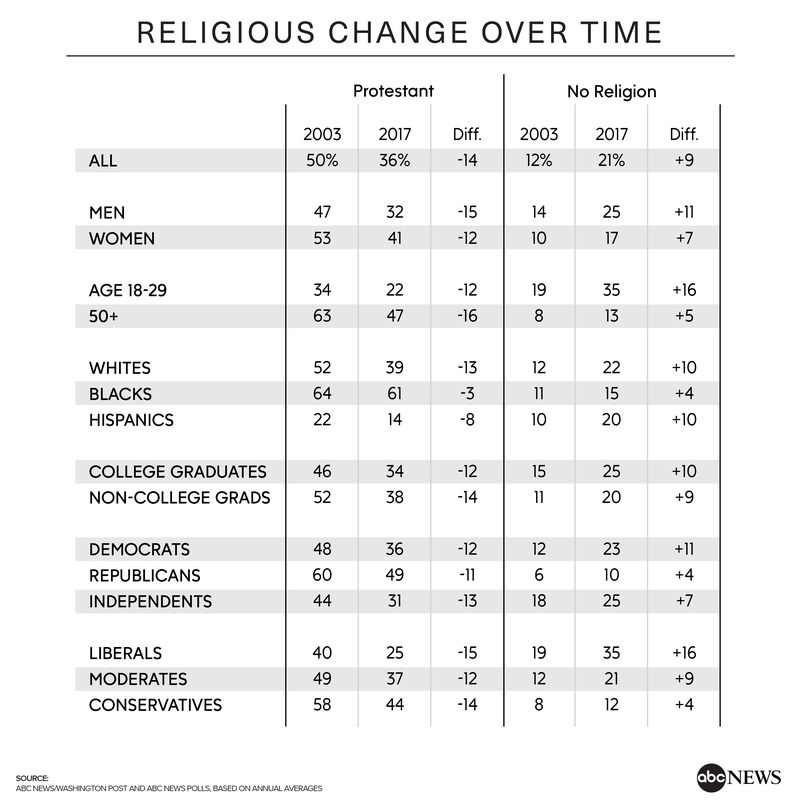 Among all Protestants, 56 percent currently say they’re evangelical or born-again; that has held essentially steady since 2003, with virtually equal declines in the number who say they’re either evangelical or non-evangelical Protestants, down 7 and 6 points, respectively. Evangelical white Protestants are of particular interest in political terms, since they’re a core group within the Republican coalition; 80 percent supported Donald Trump in 2016. Evangelical white Protestants’ share of the total adult population has gone from 21 percent in 2003 to 13 percent last year. Non-evangelical white Protestants have gone from 17 to 11 percent. 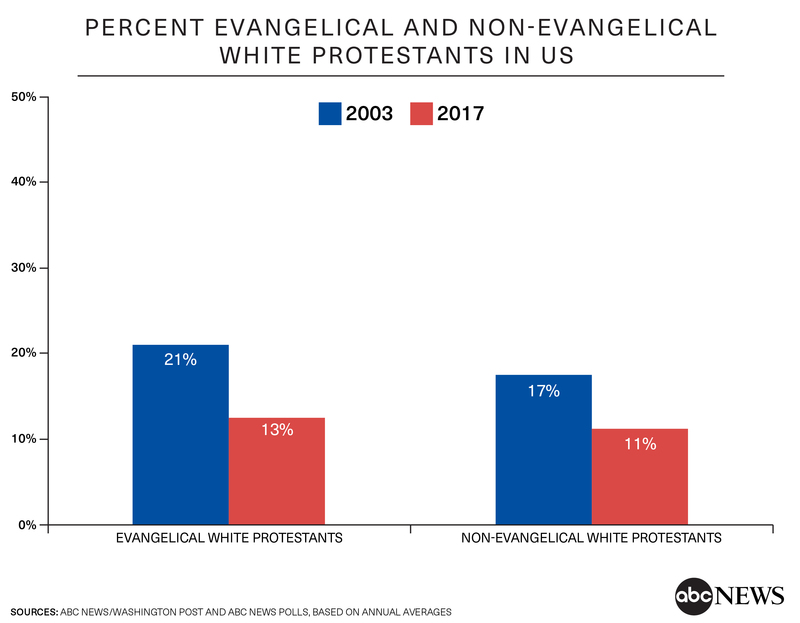 Part of the decline in evangelical white Protestants reflects the fact that the change in Protestant self-identification overall has occurred disproportionately among whites. Thirty-nine percent of whites now identify themselves as members of a Protestant denomination, down 13 points since 2003. That compares with an 8-point decline among Hispanics (from 22 to 14 percent) and just 3 points among blacks (from 64 to 61 percent). An additional factor is the shrinking white non-Hispanic population, from 69 percent of all Americans in 2000 to an estimated 61 percent in 2016, according to the U.S. Census Bureau. With the exception of race, the decline in Protestant affiliation has been broadly distributed among demographic groups. Most Protestants don’t identify themselves as Protestant but as a member of a particular Protestant denomination – Baptist, Methodist, Lutheran, Pentecostalist, Presbyterian, Episcopalian and others. Small, single-digit declines are apparent across nearly all of these groups, adding to the net 14-point drop in Protestants overall. Stability in the share of the population that’s Catholic, for its part, owes something to the increase in the country’s Hispanic population, because half of Hispanics identify themselves as Catholic. That said, even among non-Hispanic whites, the share of Catholics has held nearly steady – 22 percent in 2003 and 20 percent now. As the share of Protestants has declined, the number of adults expressing no religious affiliation has risen from 12 percent in 2003 to 21 percent of all adults in 2017. That includes 3 percent who say they’re atheists, 3 percent agnostic and 15 percent who say they have no religion. The proportions were similar 15 years ago. The largest shifts during this 15-year period include 16-point increases among young adults (age 18 to 29) and political liberals. The smallest changes have occurred among Republicans, conservatives and blacks (+4 points in each group) as well as older Americans, +5 points. Having no religious affiliation is most prevalent among 18- to 29-year-olds, at 35 percent, vs. 13 percent among those age 50 and older. It’s also higher among men than women (25 vs. 17 percent), among college graduates vs. those without a degree (25 vs. 20 percent), and among whites and Hispanics than among blacks (22 and 20 percent vs. 15 percent). It differs among political and ideological groups as well. Thirty-five percent of liberals report no religious affiliation, compared with 21 percent of moderates and 12 percent of conservatives. Twenty-three and 25 percent of Democrats and independents, respectively, don’t report a religion, dropping to 10 percent of Republicans. Indeed the non-religious are something of a political counterpoint to evangelical white Protestants; 67 percent of those with no religious affiliation supported Hillary Clinton in 2016. Other groups represent much smaller shares of the population. Using the entire 15 years of data, 1.7 percent of Americans are Jews, 1.4 percent Mormons and 0.5 percent Muslims, for example. Jews and Mormons have held essentially steady in size, while Muslims have gone from 0.4 to 0.8 percent of all adults in this period. Religious groups differ dramatically in their politics. 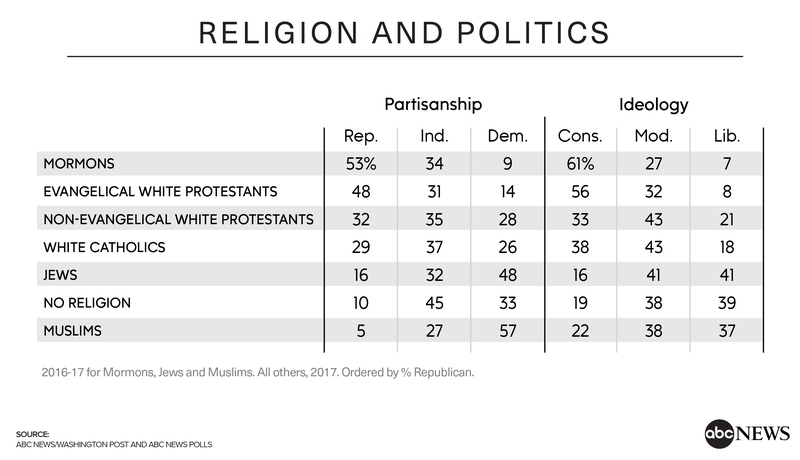 Evangelical white Protestants, as noted, are a core GOP group; 48 percent identify themselves as Republicans, 31 percent as political independents and just 14 percent as Democrats. Similarly, 53 percent of Mormons are Republicans, 34 percent independents and 9 percent Democrats. Across the political spectrum, 57 percent of Muslims and 48 percent of Jews say they’re Democrats; just 5 and 16 percent, respectively, are Republicans. Ideological differences are similar. Conservatives account for six in 10 Mormons and nearly as many evangelical white Protestants, compared with 38 percent of white Catholics, a third of non-evangelical Protestants and just 16 percent of Jews. Roughly four in 10 Jews, Muslims and non-religious adults alike are liberals; it’s half that, or lower, in other groups. Results correspond with other research. The Public Religion Research Institute found that 24 percent of Americans identified as “atheist,” “agnostic” or “nothing in particular” in 2017, up from 14 percent in 2004. Similarly, in Gallup polls, 38 percent identify as Protestants, down from 49 percent in 2003, and 20 percent have no religious affiliation, up 10 percentage points. This analysis is based on 174,485 interviews from ABC News and ABC News/Washington Post polls conducted by telephone from 2003 to 2017. Sampling, data collection and tabulation by Abt Associates of Rockville, MD, or SSRS of Glen Mills, PA. See methodological details here.